Can America Save the World Order? Kissinger says the current world order is under threat. To rebuild it the US must first rebuild itself. The Naval Diplomat hasn’t read Henry Kissinger’s new book World Order yet. Nor will I presume to review it. What I will presume to do is offer some thoughts dredged up by the synopsis he ran in the Wall Street Journal shortly before the book debuted. As befits someone who also published a book with World Order in the title — though without Kissinger’s sales, damn his eyes — I riffed on some of these same themes this week while presenting my ultrasecret anti-China battle plan to the shadowy figures overseeing U.S. strategy in the Pacific. For Kissinger the bottom line seems to be that the United States should accept that its vision of a law-based international order commands grudging support at best in parts of the world. This runs contrary to traditional ways of thinking. Over a century ago, for instance, Theodore Roosevelt implored advanced nations to exercise an “international police power.” They should keep order in their environs while shepherding developing nations into the advanced world. Franklin Roosevelt envisioned “Four Policemen” during the closing stages of World War II. FDR, that is, hoped the victors would act as international lawmen. 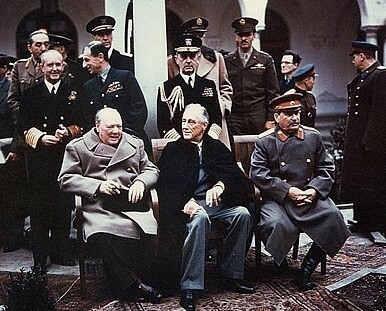 And indeed, the Big Four — the United States, Great Britain, the Soviet Union, and China, joined by liberated France — became the permanent five members of the UN Security Council. Council members supposedly combined enlightenment with material power, furthering the common purposes codified in the UN Charter. Makes perfect sense, doesn’t it? But the Roosevelts and kindred world-order enthusiasts assumed that international lawmen would enforce a common body of laws. Deadlock in the Security Council has been commonplace since the United Nations’ inception at San Francisco. What if the forefathers of world order were wrong? What if each great power entertains a different worldview? If so, what happens at the seams between jurisdictions, what happens when police quarrel over where jurisdictional boundaries lie, and what happens when one policemen meddles in another’s precinct? They need no longer acquiesce. New strategic vistas are opening before these nations as they amass great power. Economic growth gives rise to military power and political clout. Ambitions often swell as power does. Newly ascendant, newly confident powers, accordingly, may well try to enact rulesets of their own in their near abroads — if not beyond. A blend of defensive and offensive instincts fuels such policies. Woodrow Wilson wanted to make the world safe for democracy, both to protect America and because he believed democracy was so darned good for everyone. Defense, offense. Russia might want to make the world safe for oligarchy, China for — well, whatever China happens to fancy at the moment — or Brazil for thongs and 24/7/365 partying. What have you. In short, such powers will not embrace the American way just because Americans think they should. So much for the problem; what’s the solution? Let’s appraise Kissinger’s vision as a campaign. Carl von Clausewitz teaches that grasping the nature of an undertaking is the first, the most basic, the most sweeping act of statecraft. If you don’t map out the surroundings, you have little way to know which route to take, what hazards may obstruct your passage, or even when you’ve reached your destination. Next, Kissinger’s quest won’t be a static thing. Dynamism will be its watchword. Like any quest, moreover, it’s apt to encounter resistance. Formidable opponents may conclude that world order, American style, works against their interests, their ideals, or both. Nor are prospective spoilers potted plants, inert masses on which Washington and its allies work their will. They may try to balk, coopt, or corrupt the quest. Assuming it remains steadfast, America will reassess and adapt — prompting antagonists to take countermeasures of their own. And back and forth it will go. Reversals, re-reversals, and re-re-reversals of fortune will be commonplace in this interactive, open-ended twilight struggle. Where do we stand at present? Kissinger seems to think the post-World War II campaign for world order crested around the turn of the century. If so, the United States, its allies, and its friends now find themselves on the defensive if not in retreat. But at the same time, Kissinger seems to think America can commence its quest for world order now, as though it’s a brand-new venture. His countryman Clausewitz would dissent. Here’s why. Think about Clausewitz’s concepts of the culminating points of victory and the attack. When one belligerent instigates offensive action — say, by invading a neighbor — it builds up to some maximum margin of military advantage. That is also its maximum margin of diplomatic advantage, an interval when it can wring the most from a reeling opponent at the bargaining table. Past the culminating point, though, the defender narrows the margin of supremacy. It reacts and innovates, sapping momentum and resources from the offensive. Ultimately, barring imaginative leadership on the attacker’s part, the margin may dwindle to zero. Worse, the combatant that opened the campaign may find itself the weaker contender. That courts disaster. A material and political deficit stares you in the face past the culminating point of the attack. Figuring out how to regain momentum is imperative. This rhythm of the battlefield applies, if somewhat metaphorically, to Kissinger’s realm of political interactions as well. The United States launched its world-order offensive in the 1940s, and Kissinger seems to think it reached its culminating point of victory around 2000. That history still counts. So do trendlines in the offensive. If you plotted the success of the world-order project along a curve, it would reach its maximum circa 2000, using Kissinger’s estimate, before tipping into decline. The curve’s negative slope would reveal visually how U.S. diplomatic say-so has faltered since then. It’s doubtful in the extreme, then, Washington can begin with a blank slate. Regaining lost momentum — bending that curve upward again, toward victory — is harder than starting anew. How can U.S. leaders retake the offensive? Persuasion — constant diplomatic discourse — certainly must be part of their strategy. But rebuilding the nation’s prosperity and renewing its military strength are just as crucial to restoring America’s mojo. This too is a never-ending endeavor. As a great man once said, people love a winner and despise a loser. If America’s scheme for world order delivers the goods, measured in peace and plenty, it will find favor among foreign audiences. If not, U.S. entreaties will fall on deaf ears. Which leads to a parting Clausewitzian word. There are no sure things in enterprises that engage clashing human wills. The outcome of Kissinger’s project is far from preordained. It will demand constant, painstaking labor over the course of generations.